A self help book for those who suspect they may have thyroid disease, or someone the care about does. It explores in autobiographical fashion, a 51 year lifetime of undiagnosed thyroid disease - the result of a birth defect. In addition, a life around family members who also share a similar disease is exposed. 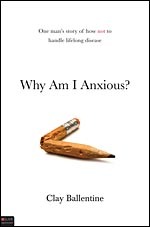 The author takes us through "growing up" with anxiety and metabolic problems always on the rise as the disease continues to grow. Through a successful, but anxiety ridden life of ever increasing symptoms and severity. He begins denial after multiple attempts to discover what his medical problem is, constantly afraid it is mental illness. The books takes us through a climatic event with the author, a thyroid storm occurs and while usually fatal in persons over the age of 10 years old, lives through the event, becomes properly diagnosed and begins effective treatment. The book includes a substantial question and answer section as well as pullout symptoms lists, and a generic letter to a physician asking for specific thyroid testing.